Before getting into this weeks book review I feel that I should address a few little things.. Number one, I understand that this review is on a Wednesday this week. This is because I’m a part of a blog tour for this book! Take a look at other bloggers reviews, the dates are attached below. Number 2, to follow through, this book was sent to me and is due to be released in April 2017! 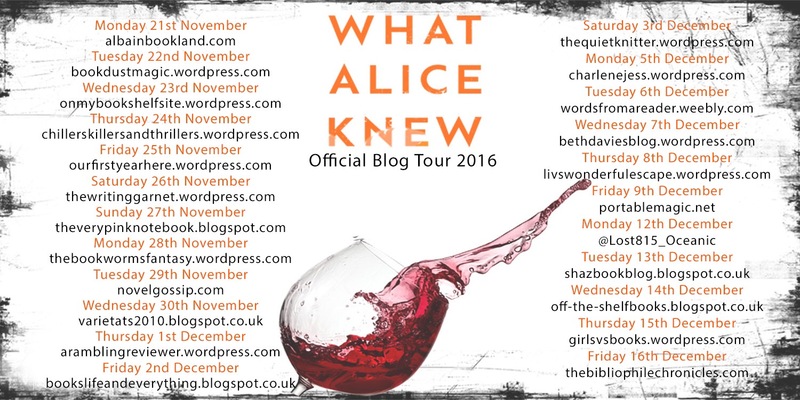 The book is by T.A Cotterell and is called What Alice Knew. I will admit that recently I’ve been going through stages and all I read is the thriller/mystery genre, this has given me a chance to thoroughly review this as I can compare it to the previous books I’ve read. Now, that being said amongst the books I’ve recently read, this has been my favourite. In fact I knew it would be once I reached the middle of the book and couldn’t put it down. It was fantastic. Bloody loved it, well done Mr Cotterell! You’ve done brilliantly. This psychological thriller had me feeling all sorts, straight from the beginning and by the end I was left in utter disbelief. Alice had the perfect life with her husband the doctor and two children. Her career as an artist was blooming and life was going well until an unexpected turn and it left her feeling unhappy and confused about making the right decision. To make things worse an old friend from her past has sprung back into her life she realised that it definitely wasn’t a pleasant surprise. 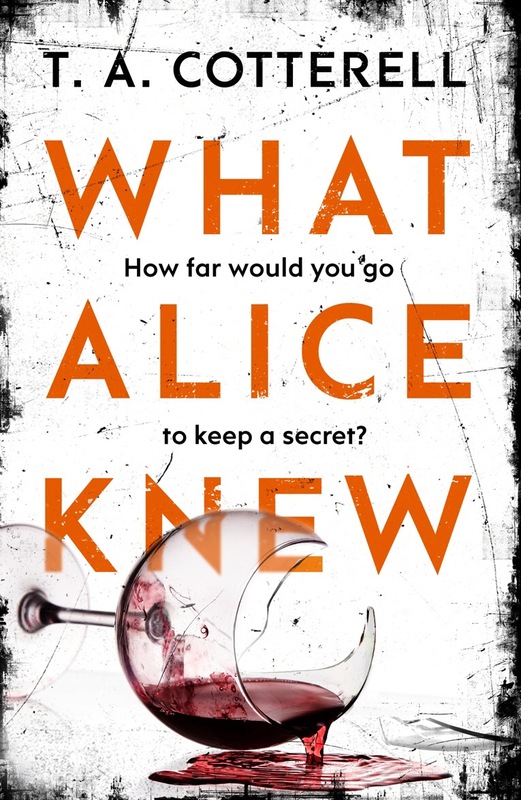 Now it’s time for Alice to make big decisions even if it does have big consequences for her loved ones. I totally recommend purchasing this book if you like something that gives you an unpredictable ending (don’t we all?). I read this book after I read B.A Paris, Behind Closed Doors and even though I loved both I definitely think I preferred What Alice Knew. It was brilliant and intelligent. This week’s book review is slightly different, I’m not just reviewing a book this week but discussing the author, the incredible Giovanna Fletcher. Having been a huge McFly fan for so long when I had heard that Tom Fletcher’s wife had released her first novel I almost burst with excitement, as I have done for all her books. Each year I anticipate the arrival of her new release with hopes that it’ll be as good as the last and she is yet to fail me. Giovanna is an author, actress, mother, wife, YouTuber, blogger and all round spectacular woman. She discusses body confidence, motherhood, family and general life antics on her social media. Giovanna is known to uploads weekly YouTube videos to her sister in law Carrie called ‘Dear Carrie/Dear Gi’ to keep in touch with their lives. Giovanna has written 4 books and 2 short stories. All of which I personally think are bloody fantastic. They’re written wonderfully, so well thought with beautifully described characters. Billy and Me is about a young woman named Sophie who lives in a small town with her mum and works in a cafe. Unexpectedly meeting a handsome, Billy Buskin an English actor who Sophie had no idea existed but resulted in making a huge difference in her life. This story has a wonderful story line and flows so well, I read this whole book in less than a day because I just couldn’t put it down. It has me hooked from the beginning. It was funny, realistic and captivating. Giovanna also wrote a short story called Christmas with Billy and Me which extends on their life together and the lengths Sophie, Billy and their family go to in order for Sophie to help an anonymous man to propose to his partner. It’s such a lovely, thoughtful way to extend upon the book and further develop the characters. Always with Love is the final instalment of the Billy and Me series in which Billy goes back to continue acting in L.A which becomes a strain on his relationship with Sophie as they lived long-distant for several months. This book really finalised the series for me, it gave me everything I wanted for Sophie as a character and also helped me to understand some of the characters that were introduced in the first books (Colin and his children). It really was such a wonderful third book and for me, if there were no further books on Sophie and Billy’s story, I wouldn’t be disappointed at all. These three books are so wonderful and I re-read them all the time. They provide such a loving and compassionate story which represents the true love between partners and families. You’re the One That I Want was my favourite of all Giovanna’s books, it’s brilliant. This book really helped me understand the possible consequences of having a long-distance boyfriend but also that that if you love each other things will work out in the end. It’s about 3 lifelong friends, Maddie, Rob and Ben who have known each other since they were children. Throughout their teens, Rob and Maddie fell for each other and begun a lasting relationship but along the way Ben had realised his true feelings for Maddie causing a very inconvenient love triangle between three best friends. Whilst Rob went off to University of Nottingham, Maddie and Ben made their way to University of Bristol. Along the way, all three of them found themselves in troubled situations in which they all must realise what they truly want. It’s brilliant, it was so easy and lovely to read. It was another book that I couldn’t put down and I was so glad that Giovanna had continued with writing such beautiful and well-thought stories. This was such a pleasure to read and it was written with such a big heart. It broke my heart for sure. Dream a Little Dream was slightly off for me, It was a great book with so much charm to it and I thought it was such a lovely add to Giovanna’s collection. Sarah had been single for 2 years and it made matters worse that she spent so much time around her ex-boyfriend due to their shared friends. She was working as a personal assistant to the most horrific man in London and her ability to constantly disappoint her mother really put her down, but she was actually quite happy with her life. Unexpectedly, Sarah had begun to dream about an old friend from University who she had really grown attached to, ‘Dream Brett’ was everything she wanted in a man. Until ‘Real Brett’ begun working with her and things became a little awkward. It was written wonderfully and it was such a sweet story to read. I enjoyed it don’t get me wrong but after reading You’re the One That I Want, for me, nothing could compete with it. Dream a Little Christmas Dream is another short story that extends on Sarah’s life and how it had been magically turned upside down by an unexpected love. Sarah is truly happy and becomes even happier by the end of the book. I thought this was such a lovely short story and I really do think these short stories have had such a good and positive impact on the novels. Overall, these books are brilliant. They’re witty, romantic, realistic and full of surprises. They’re such a lovely read that kept me mesmerised from the beginning. I can’t help but love Giovanna’s work and definitely look forward to reading her next novel. Let me know your favourite book and author and I’ll check them out. Giovanna recently announced her new book called Happy Mum, Happy Baby. Due to be released February 2017. This book is ideal for all you mums and dads who want to learn more about the never ending, full time job of parenthood. Book Review: Fantastic Beasts and Where to Find Them. Hey, it’s that time of week again! I have been a huge Harry Potter fan for as long as I can remember. I’ve read all the books and I’ve watched all the films and to the day, I can’t stop loving them. This book was published in aid of Comic Relief and all of J K Rowling’s royalties went towards Comic Relief. It’s fantastic, it’s designed to look as if it’s the property of Harry Potter himself. The film is due to be released November 198th in the UK. The trailer is available here. It’s pretty much an A to Z list of all the mythical creatures in the wizarding world. It’s truly magical and definitely helped fill the gap for not having any new Harry Potter books or films. It’s so fun to read and is something you can look at over and over again without getting bored. In the book, it has the Ministry of Magic Classification, in which provides 1 to 5 crosses for each fantastic beast in regards to their levels of danger. For example, Unicorn has 4 crosses and is stated to require specialist knowledge and skilled wizard training to be handled. It’s wonderfully designed and written, although if you’re looking for a story in this book you’re better off reading the Harry Potter books. It has no real story to it but it’s still so clever and I for one cannot wait for the film to be released. I bought mine from Waterstones for £5, have a look here. 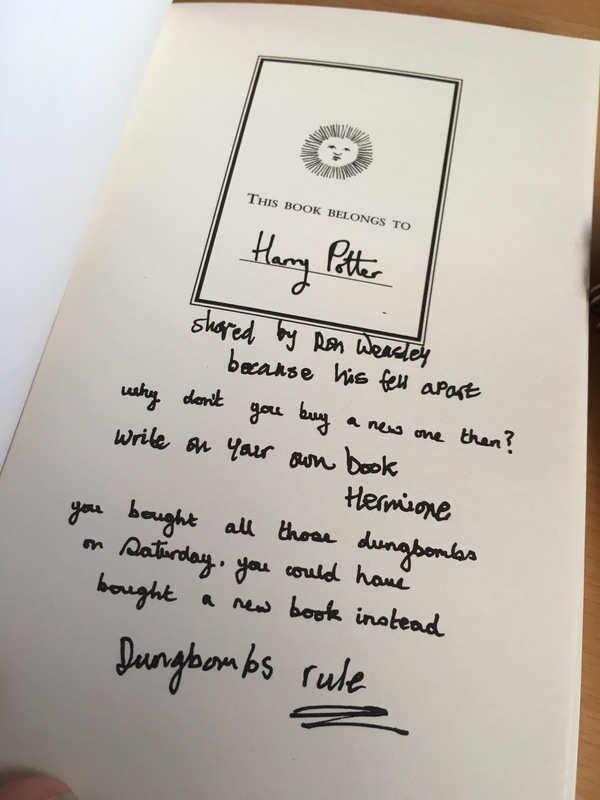 You should definitely read this if you’re a lover of Harry Potter!